The Can Vies social centre in Barcelona made headlines around the world when its eviction led to five consecutive nights of rioting in late May 2014. But the social center has a longer history than this. Can Vies, originally built in 1879 to stock construction materials for the city’s subway, became the headquarters of the anarcho-syndicalist CNT transport union during the 1930s Spanish Revolution. Following Franco’s victory in 1939, the building became the center for a fascist, hierarchal labor union. In 1997, the building was abandoned by its owners, Barcelona’s transport authority (TMB), and was subsequently squatted by the neighborhood’s youth. Since then, the Centro Social Autogestionado Can Vies has become a well-used and well-loved community space providing a variety of services to the people of Sants, a neighborhood with a strong tradition of cooperatives. The centre has hosted neighborhood assemblies, political meetings, workshops, films and concerts. A local newspaper, La Burxa, has been produced there since 1998. Inter-squat solidarity started long before the announcement of Can Vies’ eviction by the Barcelona city officials. In May 2013, Can Piella, a Squatted Social Centre (SSC) in Montcada i Reixac near Barcelona, which connected urban and rural squatting, was evicted. With the help of their farmer neighbors’ agricultural machinery, barricades were set up around the house to slow police from reaching their self-managed farm. That year, police also sealed off the SSC, impeding people from entering and effectively preventing the squat’s political activity. In February 2014, it was the turn of La Carboneria, near Seville, to get evicted—another SSC with a strong political agenda. Other squat evictions followed. Squats supported each other in resisting eviction, which consolidated ties of mutual aid against repression. The strengthening of solidarity finally reached a high point with the active opposition to the eviction of Can Vies and the beginning of the building’s demolition. The existence of a self-organized space appeared to be a threat to the city administration, and Barcelona mayor, Xavier Trias, ordered the eviction. Despite huge opposition (the squat had the support of more than 200 community associations), the eviction went ahead. This immediately triggered protests in Barcelona and in other cities beyond Catalonia. In Valencia, 500 gathered, in Girona, 250, in Lleida, 200, Sabadell, Hospitalet and Vic, 150 in Tarragona and Manresa, 100 in Terrassa and Igualada, and further demonstrations were held in Madrid and throughout Spain. During the first days of protest, 4,000 demonstrators came to Sants, and on Saturday over 10,000 people marched through the city. On the third day of protests there were demonstrations in no less than 46 districts in Barcelona. The third day was crucial, as there had not been riots lasting longer than two days in the city centre since the downfall of the dictator Franco in the 1970s. “There was a quiet atmosphere until nightfall, while people throughout the city were discussing what had happened. During the afternoon, people gathered in their own neighborhoods. 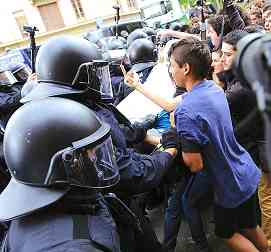 In Nou Barris, a potentially rebellious proletarian zone, a strong police presence was felt and prevented people from congregating in a single area. In Sant Andreu, the crowd blocked one of the main streets with burning containers. Most of the protesters moved from their own neighborhoods across the city in wild demos and towards Sants, probably making it more difficult for the police to contain them, and also providing the opportunity for those less experienced participants to join in taking the streets. “Around 5,000 people marched in the rain from Plaza de Sants to Plaza Espana. The people refused to disperse, and confronted a huge police deployment. Rioting started and, for the second time in their history, the militarized police, the mossos d’esquadra, used tear gas. “The police quickly took Carrer de Sants, but they had to fight at every street corner to arrive at the streets around the neighborhood. Demonstrators split up; people defended themselves fighting in groups of 50 to 500. “The third night, a smaller number of hammers, picks and Molotov cocktails appeared, and fewer projectiles were thrown except when protesters came across glass containers and construction sites. At one building site located in Plaza de la Farga, right across the street from the building of an anarchist squat evicted years before, people resisted for at least half an hour, at times forcing the police to retreat and direct their attack to another street. By May 29, the city council called an end to the demolition, its hand forced by the extensive destruction of equipment, widespread protests, and the announcement by Can Vies that the rebuilding of the social centre would begin two days later. That day, several work groups started to clear the space and to recover as many bricks as possible. Hundreds of people formed a line, almost a third of a mile long, to pass bricks to the site and deposit rubble outside the district hall. The legitimacy of Can Vies was unquestioned by passersby and small shop keepers, who were curious about the situation. The squatters launched a crowdfunding campaign for $74,200 to rebuild the squat and pay for the legal defense of those arrested that eventually received almost $95,400. The threat of eviction united two tendencies in the squatting movement: those focusing on mobilization of popular discontent through direct action succeeded in temporarily blocking the eviction, while social advocacy organizations used sophisticated techniques to publicize the resistance. The successful anti-eviction struggle demonstrated the importance of inter-squat solidarity and the effect a diversity of tactics can have in generating powerful resistance. Squatters organized non-violent actions during the two months prior to the eviction. These included solidarity campaigns on Twitter, the occupation of TMB offices, and symbolic actions at relevant institutional buildings. Can Vies has been rebuilt and currently hosts daily community activities including political work, and provides a rehearsal room for bands, an audio-visual space and a sewing workshop. It was clear that only strong, popular opposition would save Can Vies from demolition, and it was so.